This revelatory exhibition is curated by David Musgrave, one of the leading figures within an emerging generation of British artists. 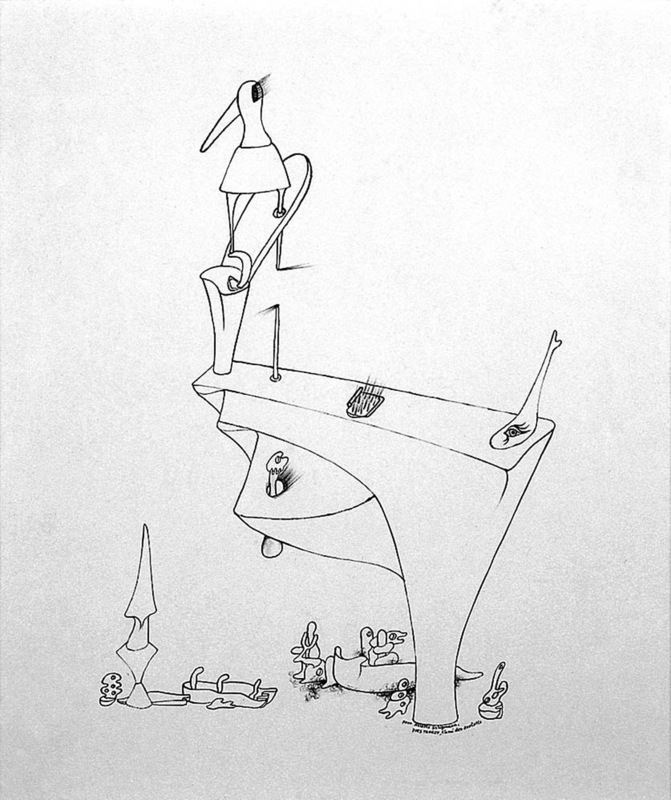 It presents new work by Musgrave and that of his contemporaries in juxtaposition with a 19th Century lithograph by Georg Scharf and a drawing by Yves Tanguy. Waste Material is an exhibition about time, matter and the imaginary. 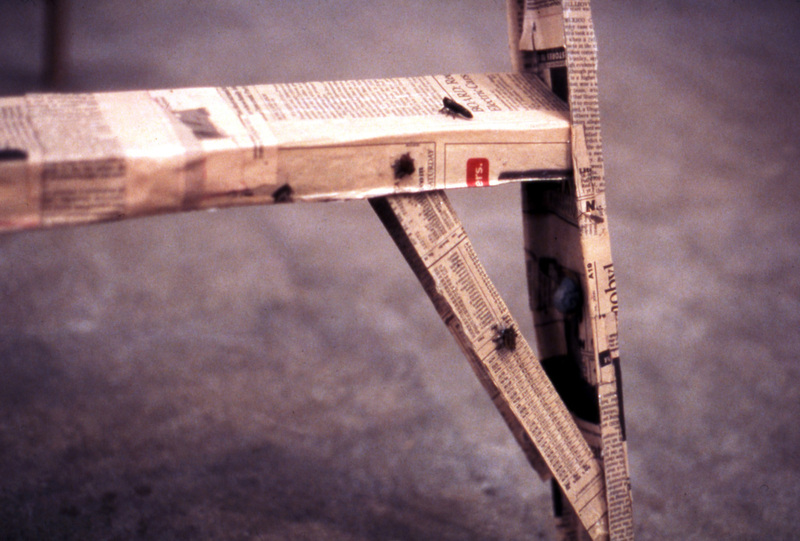 Hannah Greely's 'Assembly', a papier-mache stepladder which is home to numerous handmade insects, implies a future world from which human beings have been erased. At the opposite end of the time-line is Georg Scharf's Duria antiquior (A more ancient Dorset), a print made after a drawing by the geologist Henry De la Beche based on fossil evidence of prehistoric life, which offers a complementary impossible perspective. 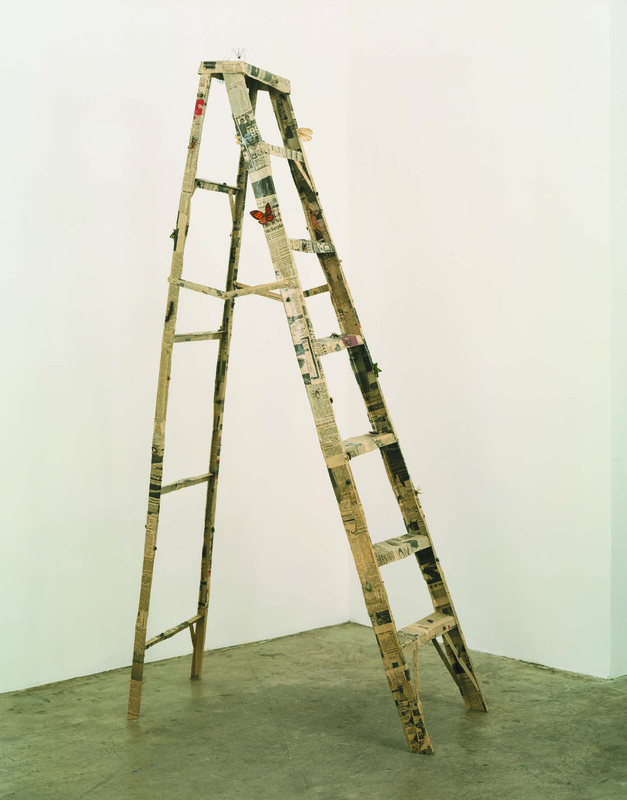 A degree of material and pictorial instability characterises the other work in the show. Rupert Norfolk's 'leaf' sculpture is in a state of fixed indeterminacy, being at once recognisable and not quite legible, and this has something in common with Yves Tanguy's shifting but precisely rendered, other-worldly forms. William Daniels' paintings are derived from paper tableaux that echo romantic and religious paintings of the past; they manage to be at once frail and graphically precise. Clare Stephenson's drawings take as their starting point constructions she has made from art historical reproductions, scraps of wood and wire. The results are unpredictable mutations, worlds in themselves that also initiate a peculiar dialogue with their origins. 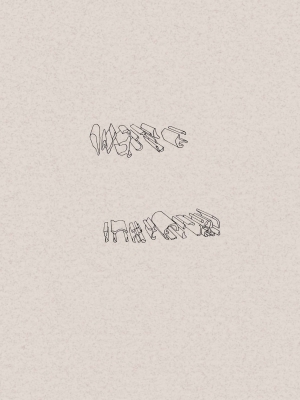 Both the drawings and the sculpture by David Musgrave take as their point of origin a small piece of material that has been reproduced in a way that stresses its potentially figurative characteristics. William Daniels lives and works in London. Group exhibitions include XS, fa projects, Death and Magic, Keith Talent Gallery (2004) and forthcoming The Darkest Hour, The Leisure Club Mogadishni, Copenhagen. Hannah Greely lives and works in Los Angeles. Solo shows include Fold, Andrea Rosen Gallery 2, New York, (2004) and she will be included in Thing:New Sculpture from Los Angeles, UCLA Hammer Museum, Los Angeles in 2005 . David Musgrave lives and works in London. Solo exhibitions include art now, Tate Britain (2003), Transmission, Glasgow (2002)and greengrassi, London (2004, 2001 & 2000). Group exhibitions include Arnolfini, Bristol (2003). Rupert Norfolk lives and works in London. He will have a solo exhibition at Dicksmith Gallery, London in 2005 and group exhibitions include Animations, Kunst-Werke, PS1, New York, (2001), and Tripping Over a Varicoloured Tangle of Wires, The Lowry (2004). Clare Stephenson lives and works in Glasgow. Solo exhibitions include Transmission Gallery, Glasgow (2004) and forthcoming, The Round Room, Talbot Rice Gallery, University of Edinburgh. A 24-page catalogue with eleven full-colour illustrations and a text by David Musgrave, was published by Drawing Room to coincide with 'Waste Material'. Go to Publications for ordering information. The exhibition will tour to Turnpike Gallery, Leigh, 15 October - 26 November 2005 and Wolsey Art Gallery, Christchurch Mansion, Ipswich, 3 December - 26 February 2006. "Waste Material" is funded by Arts Council England, London and The Foyle Foundation.